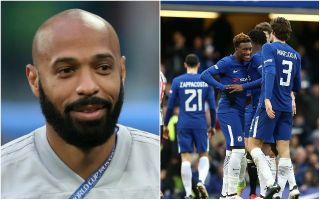 Monaco’s new manager Thierry Henry could reportedly land Chelsea starlet Callum Hudson-Odoi as his club’s sporting director Michael Emenalo eyes him in the January transfer window. This is according to the Daily Mail, who claim the Ligue 1 giants are keen to snap up some top young English talent, with many youngsters here now increasingly trying their luck abroad due to the lack of playing time available to them in the Premier League. The report suggests Monaco could be a tempting move for Hudson-Odoi, who has not featured for Chelsea this season despite for some time being rated as one of their best talents coming through. Henry has just been named Monaco manager and having a big name like him at the helm could be useful for the club as they try to snap up the best young talent. The Frenchman is highly rated after working on the coaching team of the Belgian national side, and Emenalo’s connections with his old club Chelsea could also give them some advantage in any deal. Hudson-Odoi, 17, has played just five times for the senior CFC side, and could look at the likes of Jadon Sancho and Reiss Nelson for inspiration with a move abroad, perhaps even just on loan.